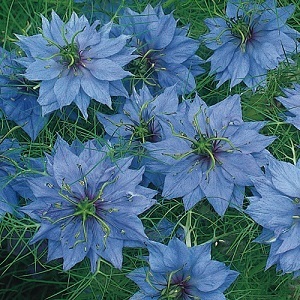 A heritage variety of Love-in-a-Mist with pale blue flowers from July to August/September. Nigella is a tall hardy annual, growing on strong stems in groups or gaps in a border, to a height of 50-60cm. Nigella makes a good cut and dried flower. Plants have decorative seedheads in winter. Nigella likes full sun and light well drained soil. Pack of approx 1000 seeds. Sow in autumn or spring. Sowing instructions and a colour photo are printed on the packet. Sow Sow in spring or autumn. 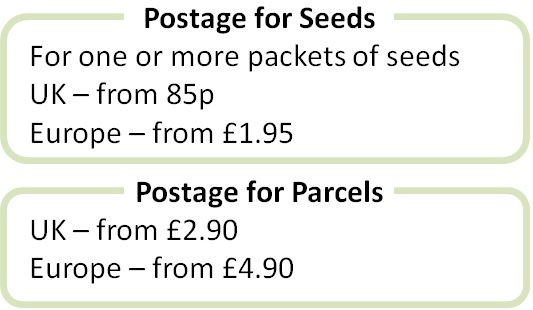 Sow directly into cultivated soil in September/October or in spring from March to May. Sow 2-3cm deep and germination takes 2-3 weeks. Or sow in spring in modules of seed compost 3-4mm deep and keep at 15-20°C. Germination takes 7-10 days. Transplant seedlings into the garden in late spring, being careful not to disturb the roots. Grow Deadhead to encourage flowers. Leave some seedheads on the plants at the end of the season if you want the plants to self-seed. Self-seeded plants may flower in a wider range of colours. Remove plants in the autumn when they have finished flowering.